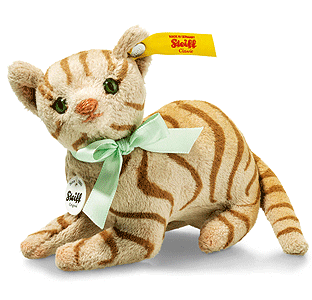 Mitzi Cat is from the Steiff Classic collection and made in beautiful light brown cuddly soft plush. This wonderful Steiff Classic piece, is a yellow tag edition and wears the famous stainless steel button in ear. Attention all cat people! Mitzi cat is a swift little kitten made of soft and cuddly plush material. She’s wearing a lovely light green collar around her neck. Her coat consists of very short plush fibres, making her fur extra smooth to the touch. Mitzi has a height of 11 cm and features a stunning striped pattern. She also has wires in her legs that give her stability and a lifelike stance.